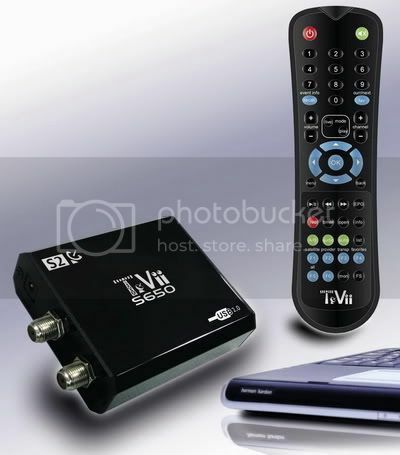 HD Satellite TV TeVii S650 USB box With the S650 Taiwanese manufacturer Satellite Receiver TeVii introduces a further development of its DVB-S USB Box S600, which is now also capable of receiver high-definitions channels HDTV. The S650 Box comes in a metal case which gives it a very sturdy look and the level of workmanship is also very high. Its backside features a satellite IF input as well as a loop-through output. An external power pack – which is also connected to the rear panel – provides the box with all the power it requires. On one side we find a USB host interface for connecting the box to a Windows or Linux based PC with USB 2.0. In case you’re wondering: yes, it’s true TeVii also offers a Linux driver for its latest product. An infrared LED is located behind a protective cover on the front panel for picking up commands from the remote control, a feature that worked brilliantly in our test. The complete package comes fully equipped with the S650 USB box, the external power pack, a USB 2.0 cable, the remote control, a short user’s guide, batteries for the remote controlas well as a CD with all required software and drives. A comprehensive instruction manual is available as PDF. As minimum system requirements for its new USB Box TeVii specifies Intel Pentium 31GHzor higher, for HDTV capabilities the box requires Intel Pentium 4 2 GHz with 128 or 256 MB RAM respectively, DirectX 9 or higher as well as a graphics card with a minimum of 16 MB dedicated memory. Of course a USB 2.0 port is also required. In general, most modern PCs will be able to meet these requirements, particularly as MS Windows 2000, XP and Vista are all supported. Linux drivers are available as well. TeVii ships the box with a whole range of software applications such as the TeVii in house software suite, software forInternet-via-satellite, Sky Grabber – which we will discuss later in more detail and the well-known and popular ProgDVB PC software for DVB-S/2. Our Windows Vista PC recognized the TeVii S650 box right after plugging it in and prompted us to insert the driver CD. Thank-fully TeVii does not only provide 32-bit Windows drivers but also all 64-bit drivers that Windows Vista64 users need. This was an unexpected surprise and a point we cannot praise highly enough. It can only be hoped that other manufacturers follow TeVii’s example and that way push the upgrade to 64-bit operating platforms. The required drivers are installed in a breeze and as a next step we recommend installing the full software pack-age from the CD. The installation process of the individual applications is for the most part self-explanatory. When the TeVii software is launched for the very first time the user is greeted by a black window and an empty channel list, as there are no pre-stored channels available. The user interface of myTeVii is clearly structured and looks quite straightforward. To the right we find the channel and satellite list, with the actual TV channel being shown to the left of that. Of course the window size of the Television channel can changed as required and it goes without saying that a full screen presentation mode is avail-able as well. myTeVii is quite inter-national and can be customized for the following languages: English, German, French, Arabic, Chinese, Finnish, Italian, Polish, Russian, Spanish and Swedish. The TeVii box supports DiSEqC protocol 1.0 for up to four LNBs as well as protocol 1.1 which means it can be used with a multi-focus antenna. Owners of motorized dishes are looked after as well because both hardware and software are compatible with DiSEqC protocols 1.2 and 1.3 (USALS). USALS settings can be adjusted very conveniently via thesettings menu of the TeVii software which fully controls a 1.3-based motorized dish. In general satellite receiver TeVii in-house software allows a huge range of configuration options, such as defining individual LOF parameters for each satellite. The corresponding values for the Ku and C bands as well as for LNBs used for the reception of circular signals are already pre stored. In addition, a few mouse clicks is all it takes to change the DiSEqC parameters as well. Once the software has been configured to work with the existing antenna equipment the next step consists of performing a channel search to fill the virtually unlimited channel memory with data. To that end, a preset satellite list with 177 European, Asian and American position is available. This and the corresponding transponder data are very up-to-date, and even if the odd parameter might not be 100% accurate this can be corrected in a whiz by looking up the required settings at SatcoDX.com. Obviously it is possible to edit satellite and/or transponder data by updating existing entries with only a few mouse clicks or by entering new satellites ortransponders just as quickly. If you want to fill the TeVii box’s channel memory it is enough to mark one, several or all transponders of a satellite entry and activate the channel search. The software took a little less than eight minutes to scan a satellite with just over 100 transponders, which is a slightly above average achievement. During our test the TeVii box delivered some remarkable results. On the one hand it turned out to have a low threshold and to be able to also handle weak signals, such as trans-missions from ASTRA 2D 28.2° East at our test location in Munich, for example. On the other hand it works very well with SCPC signals and has no problems processing low-band-width SCPC signals. Our test transponder on TURKSAT 42° East with a symbol rate of just over 2000 KS/s came in flawlessly. In reception mode the TeVii can be set to display EPG information in the status bar of the application window, if these data are provided by the respective channel. In addition, a full OSD insert can be called up, which is particularly handy when controlling the box from the couch with the included remote control. We believe the OSD layout deserves special praise as it does not only display the channel name when zap-ping, but also scrollingly provides extended EPG information and this way offers much more detailed background information than we would normally expect when switching channels. This is a truly great feature that we really love! Speaking of special praise, the software turned out to communicate brilliantly with the included remote control which is clearly labelled and convenient to use. The channel list is another high point and offers a whole lot of sorting and adjusting options. For example, channel can be sorted according to bouquets, transponders or satellite TV or radio channels can be faded out with a simple click of a button and you are free to set up several favourite lists. The channel list can be edited directly in the main window. Individual entries can be updated via satellite, renamed or protected with a PIN code from unauthorized viewers, such as children. For a DVB-S/2 PC solution channel switching is ok with about three seconds. Between HDTV and SDTV channels it takes a little longer. 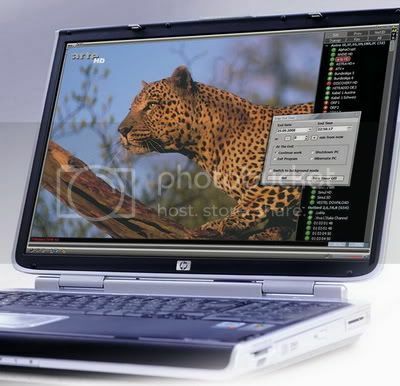 The one major advantage of DVB receiver for the PC is the option to record onto the PC’s hard disk, and this is also one of the draw cards of the Sky Grabber TeVii. Timer records can be set up effortlessly and time shift is avail-able, meaning that you can freeze the current program at any time and later continue from exactly that point with a single touch of a button. Another practical feature is the TeVii’s software capability of recording all events in a special DVD-compatible mode, in addition to the standard transport stream. The integrated EPG is a beauty as well and displays all information in an organized way. Events can be marked for recording directly in the EPG, and you can even set up the timer to record daily or weekly events. To make sure you don’t miss a single scene you may even add extra time before the beginning an after the end of every recorded event. The perfect overall impression of the TeVii software is rounded off by a dedicated plugin interface. This allows software developers to create extensions and add-ons for my TeVii and to offer new and useful features. The only thing we missed really badly during our test was being able to use CI modules for pay TV reception. However, the manufacturer will bundle the card with a USB cardreader for some areas at the time when this report gets published. Our test PC was equipped with an Intel Core2 Duo 1.8 GHz processor and was able to display SDTV and HDTV in either 720p or 1080i absolutely flawlessly, even without draining too much processing power from the system. This means you can work with other applications while watching satellite TV using the my TeVii application. With a slightly older Intel Pentium IV system interference-free HDTV was at first only possible with 720p, while 1080i resulted in a number of dropouts, but the manufacturer responded quickly and released a new software version during our test, which fixed even this problem. While most metropolitan areas have high-speed Internet infrastructure the situation is a little less satisfactory in some rural regions. Frequently there are no cable network and DSL solutions sometimes don’t work due the large distance between interchange and user. In such cases Internet-via-satellite may become a real alternative and the TeVii Data application that comes with the S650 constitutes the right software tool for that. When installing the software it installs a network driver which allows to set and edit all required TCP/IP parameters. It suffices to select the desired provider (out of a list of 27 providers/satellite positions) or you may choose to enter all details manually. The software then checks if the antenna is aligned correctly and activates Internet access. The SkyGrabber demo software also comes from the field of internet-via-satellite and relies on the fact that – contrary to landline Internet access internet-via-satellite sends data not to one user specifically, but basically to every one within the satellite’s footprint. Data received from the satellite are filtered and SkyGrabber tries to assemble pieces of music, films etc. to create complete files. Please note, however, that saving third-party material may be illegal under certain circumstances. Before we finish we have one word of advice for all DX enthusiasts out there: of course you can use the HD Satellite TV TeVii S650 USB box with, for example, the ProgDVB software with Elecard codec to receive MPEG 4:2:2 feeds, for exam-ple from EUTELSAT W3A at 7° East.